Highlights from the final round of the WGC-HSBC Champions in Shanghai. Xander Schauffele secured his third PGA Tour title with a play-off victory at the WGC-HSBC Champions in Shanghai. The American birdied his final two holes to close out a four-under 68 at Sheshan International and join overnight leader Tony Finau - who posted a final-round 71 - on 14 under. 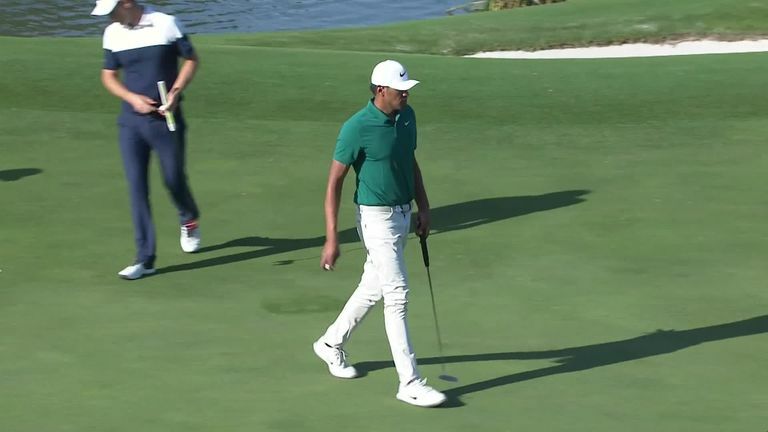 The players returned to the 18th, where Finau found a bunker off the tee and had to lay up on his way to a par, as Schauffele found the par-five green in two and two-putted for a winning birdie. "It means a lot," Schauffele said. "Last season, I really wanted to win in my rookie year and wasn't able to do that. I felt like I was playing great all day." Starting the day with a three-shot lead, Finau bounced back from missing a five-footer at the first to make a two-putt birdie at the next, as Schauffele also birdied the second and cancelled out a bogey at the fourth with gains at the fifth and eighth. Finau kicked off his back nine with a birdie but lost his outright lead with back-to-back blemishes over his next two holes, as Schauffele holed from four feet at the 13th to move into pole position. The lead changed hands again when Finau rolled in from 10 feet at the par-five 14th and Schauffele made a three-putt bogey at the next, where Justin Rose also dropped a shot to end his hopes of defending his title. Schauffele made a 15-foot birdie at the 17th to move back into a share of the lead alongside Finau, before the par exchanged gains at the par-five last to extend the contest. Rose finished four strokes back in third, with Andrew Putnam and Kiradech Aphibarnrat six shots back in a share of fourth spot. World No 1 Brooks Koepka posted a three-under 69 to end the week on two under, while Rory McIlroy finished in tied-54th after a final-round 74.